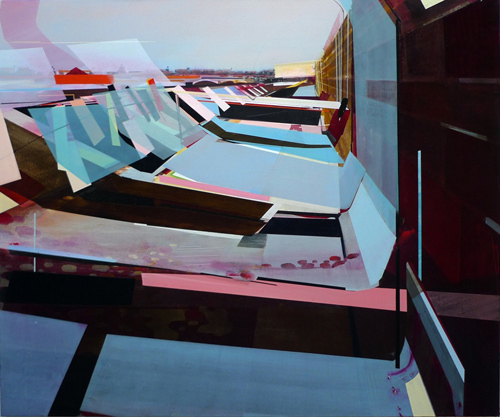 Dimitri Kozyrev, Last One 18, 2012, acrylic on canvas, 60 x 72”. Wassily Kandinsky begins “Concerning the Spiritual in Art” (1911) by railing against attempts to “revive the art principles of the past,” but makes an important exception for art that resuscitates “the external forms which served to express those inner feelings in an earlier age.” Viewed through this lens, Dimitri Kozyrev’s joyously complex paintings revitalize the idealism and vigor of an earlier time, recalling Kandinsky’s own radiant abstractions and, in their hints of representation, those by Arshile Gorky. Like Kozyrev, both of these artists often relied on memories of their homeland for narrative and emotional inspiration. In his latest body of work, inspired in part by the meditative quality of the visuals in Tarkovsky’s film Zerkalo (The Mirror, 1975), Kozyrev reflects on his upbringing in Saint Petersburg, allowing the inherent uncertainty and emotional cadence of memory to inform the physicality of painting. Here color, shape, and line are deployed in intricate layers that vacillate between abstraction and representation. An array of glasslike rectangles shifts into an industrial skyline at dusk in Last One 18 (all works 2012), while the concentric circles in rainbow hues cohere in the specter of a human form in Last One 10.